UPDATE: Editor’s note: Here’s a story that we’ve updated a couple of times, and now it ultimately has a happy ending. We originally posted a picture from Oliver Broadie who thought he captured an image of the ATV-4 Albert Einstein right before it burned up in the atmosphere. That image, see below, was ultimately determined to be of the International Space Station and not the ATV-4, so yesterday we pulled the image and explained why. But now, thanks to a great discussion between the photographer and satellite tracker Marco Langbroek (see it in the comment section), they have determined that Oliver actually did capture the ATV-4 in a subsequent image taken about 4 minutes later. Thanks to both Ollie and Marco for analyzing the timing and images. Also, we were in error for saying that the image showed the ATV-4 burning up in the atmosphere. That was my mistake (Nancy). And you can now actually see images of ATV-4’s fiery plunge taken by the ISS astronauts here — Nancy Atkinson, Senior Editor. Each Automated Transfer Vehicle series ferries cargo to the International Space Station, stays attached for a few months to do routine boosts to the station’s altitude, then leaves with a haul of trash to burn up in Earth’s atmosphere. Albert Einstein carried a record 5,467 pounds (2,480 kg) of cargo for its type of vehicle and also brought away the most garbage of the series of vehicles. 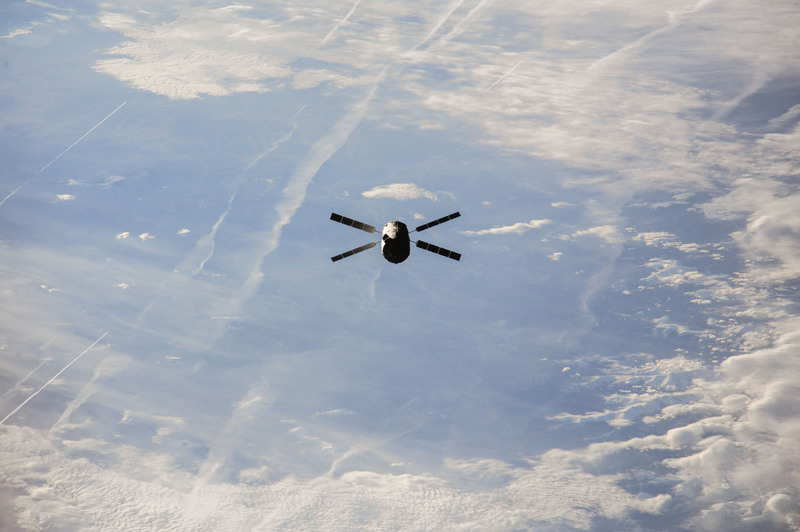 It did six reboosts of the ISS’ altitude and among its precious cargo was a GPS antenna for Japan’s Kibo laboratory as well as a water pump for Europe’s Columbus laboratory, according to the European Space Agency. The cargo ship undocked from the space station on Oct. 28 after five months in space. It burned up Nov. 2 at 12:04 GMT within sight of the astronauts. The next of the series, Georges Lemaitre, is in French Guiana for a launch aboard an Ariane 5 rocket that will take place in June 2014. The ATVs are just one of many space trucks that visit the International Space Station. Check out this recent article on cargo ships past and present to see other ones that ferry stuff into space.